The Seattle Times 44 minute · Here’s a bit of good news for Wednesday morning’s bus commute. SEATTLETIMES.COM As the snow melts, King County Metro will run 90 percent of its bus routes Wednesday The decision reflects confidence that the area will avoid a refreezing of the pavement, and that city, county and state crews can plow or salt major roadways if needed. HALEAKALA NATIONAL PARK, Hawaii (AP) — There’s snow in Hawaii, on the highest peak of the island of Maui. 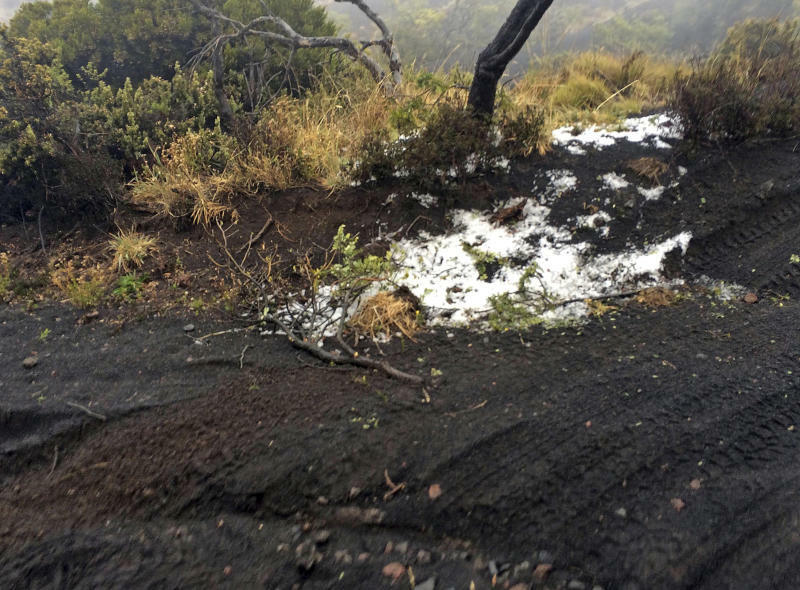 Nearly everywinter, the rest of the continental United States is surprised by headlines announcing that snow has graced the summits of Hawaii’s tallest peaks. But this week, something especially remarkable happened. As a winter storm collided with the Aloha State over the weekend, a rare snowfall turned the much lower Polipoli Spring State Park on Maui into a wintry wonderland. “It’s just real white like ice now, so it’s just blowing around and drifting,” she added. Dye also said that the temperatures at Polipoli must have been at least 32 degrees Fahrenheit, the freezing point, though the National Weather Service doesn’t have a temperature sensor there. “Very cold air aloft will once again move over the islands beginning tonight and continuing into Friday,” officials said in a notice. 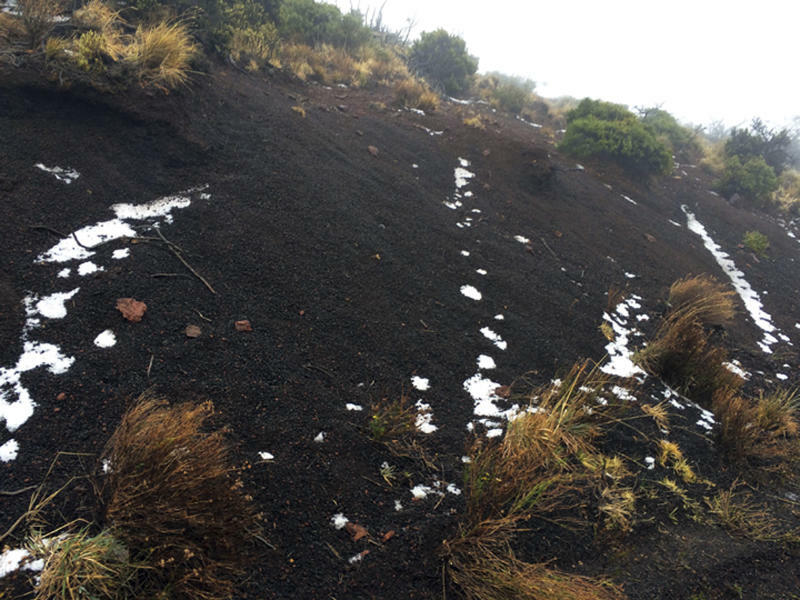 Dye told HuffPost that snow in Hawaii “is not unheard of.” The peaks of Mauna Kea and Mauna Loa, which reach higher than 13,000 feet, receive snow every winter, while the summit of Haleakala volcano sees snow at elevations above 9,000 feet every three to four years. However, snowfall at Polipoli State Park, at 6,200 feet, is out of the ordinary, Dye added. In a Facebook post, the state’s Department of Land and Natural Resources said that this may be the first snow recorded there. Dye said she couldn’t confirm whether it was the first time snow had ever fallen at the state park, but she did note that it was uncommon. For local residents, the white-dusted mountain was a sight to behold. The National Weather Service in Honolulu described the storm battering Hawaii over the weekend as a “historic low pressure system” in a tweet on Sunday. Winds of up to 191 miles per hour whipped at Mauna Kea’s peak on Sunday, while a maelstrom of waves up to 60 feet churned on Oahu’s north shore. 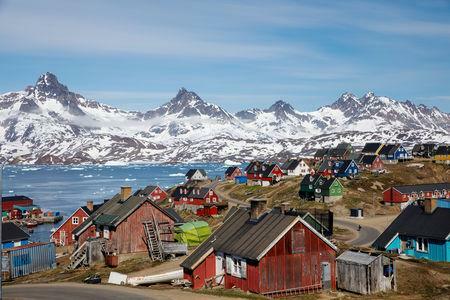 By mining sand, „Greenland could benefit from the challenges brought by climate change,” a team of scientists in Denmark and the United States wrote in the journal Nature Sustainability. The study, headlined „Promises and perils of sand exploitation in Greenland”, said the Arctic island would have to assess risks of coastal mining, especially to fisheries. 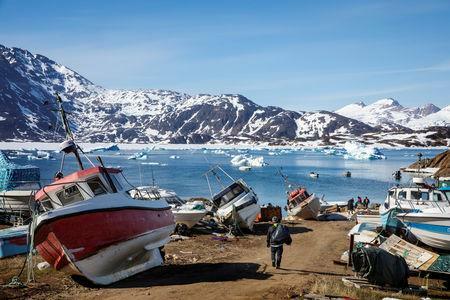 „You can think of it (the melting ice) as a tap that pours out sediment to the coast,” said lead author Mette Bendixen, a researcher at the University of Colorado’s Institute of Arctic and Alpine Research. „At the moment it is an inexpensive resource but it will become more expensive,” she said. Tanveer Ahmed@Mountain_Man007 US citizen #BryanHarlan who hunted an AstoreMarkhor few days ago at GB has said that Pakistan is more peaceful country than Mexico. if govt of Pak govt could put some investment in to tourism sector they could do great for this beautiful country.Thank you #BryanKinselHarlan 10:04 PM – Feb 7, 2019 The local press identified the goat Mr Harlan killed as a wild Astore markhor by Pakistani newspapers.It is the official national animal of Pakistan.Mr Harlan’s photo prompted outrage on social media, many from people who are angered by the lack of laws banning—or regulating—the practice of hunting markhors. The Texan hunter is the third American to travel to Pakistan and kill a markhor. Despite the swift backlash, Mr Harlan seems to have enjoyed his exotic adventure and postured himself as someone involved with animal conservation efforts. The video footage of Mr Harlan’s hunting experience shows him climbing a cliff and shooting a male marcher sitting next to a young goat before high-firing his local guides. Another video features Mr Harlan expressing his gratitude in being „welcomed with open arms” and called Pakistan a safe destination for tourists, and urged fellow Americans to follow his footsteps. „This is a perfect example of hunters and villagers coming together for a common goal of game conservation,” he said. Pakistani authorities told the Washington Post that, in the past month, only hunters—like Mr Harlan—who have paid large amounts of money are permitted to hunt markhors in the northern parts of its country as part of its efforts to protect the endangered species from potential extinction. The markhor population have reportedly been diminishing in the past several years, mainly due to deforestation, military activities, local poaching, and unregulated trophy hunting among other causes. In 2011, there were only about 2,500 markhors remaining in the region. Pakistani authorities have attempted to make strides to protect the markhors from facing extinctions, including allocating five sanctuaries in India for the rare mountain goats to roam freely and breed. About 80 per cent of the profits the Pakistani authorities made from foreign hunters are reportedly given to “isolated residents” who live in the goats’ habitat, and the other 20 per cent are allocated to the government wildlife agencies.